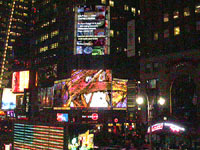 A Paper Project image was one of the winners of the Nikon Small World Competition that debuted on Times Square October 6th, 2004. This marked the start of a 17 city tour of the exhibit. More information on the competition and the tour can be found at the Nikon Small World Web Site (opens in new window). The image was also the micrograph for the month of April in the 2007 Nikon Small World Calendar. Below are a few snapshots of the event. Click on the images to see larger versions. 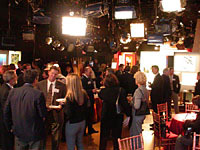 The opening reception was held at the Good Morning America Studios on Times Square New York. 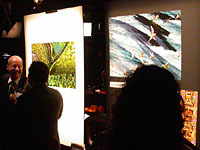 Guests arrived to a banquet and large-scale print exhibit. Beginning at dusk, the event ran into the night. 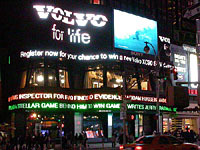 The surprise for the evening was when the images were also displayed on the giant screens outside on Times Square. 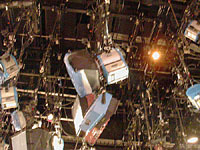 The studio was full of lights, cameras, and action. 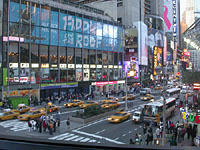 Both inside and outside the studio.